I don’t consider myself high-maintenance (but who does, right?) nor do I think I have princess qualities. But, every girl, at some point in time, wishes she was a princess. We want to feel special, we want to have nice things, we want to appear glamorous. Then, for most little girls, the reality of not becoming a princess sets in and she must come to terms with being a regular person, just like everyone else. But, even though we can’t really be a princess, what is stopping us from feeling like a princess? A few years ago, I discovered a very fun and rather quirky book by Jennifer “Gin” Sander. The book, Wear More Cashmere, is dedicated to helping women find their inner princess. Although some of Sander’s ideas are a bit of a stretch (who’s really going to design their own family crest? ), she offers 151 ways to rediscover and pamper your inner princess. Here are a few of my personal favorites that I try to practice each day. Stand Tall – When have you ever seen a princess slouch? Standing tall like Audrey Hepburn, Grace Kelly, or even Gwyneth Paltrow, gives the allure of elegance and grace – both qualities of a princess. Robed in Style – What could be more elegant than stepping out of the shower or your bath and slipping on a gorgeous robe? And, it doesn’t have to be purple velvet to feel regal – any silk robe that makes you feel beautiful will do. Tea for One – Taking tea is quite an art, but it need not be reserved for British royalty. Start with a steaming teapot or kettle of water poured into a dainty teacup, then add a high-quality tea sachet or loose-leaf tea and a bit of sugar and/or cream; then sip, relax, and practice your princess wave. That’s a Wrap – From silk to cotton, long to short, and chunky to thin, scarves and pashminas are becoming quite popular these days. But, even before their recent popularity, scarves were worn by Jackie Kennedy and Princess Grace, two icons with exceptional princess style. Pearls of Wisdom – No need to wait for a fancy ball or even a wedding to wear those precious pearls, flaunt them during a shopping trip or a night out with the girls. 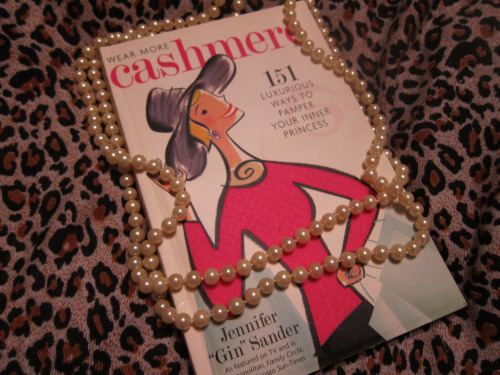 Want instant glamour – add some pearls! Only the Best – You may be on a budget, but that doesn’t mean you need to pinch pennies when it comes to your inner princess. Whatever it is you need or want, buy the best you can afford and enjoy every penny you’ve spent. Need a new bath towel? Buy a luxurious Egyptian cotton towel from an outlet store. No one needs to know it was only $10! The Sound of Music – If there’s one thing I hate, it’s waking up to the sound of an obnoxious alarm clock. Instead, I program my alarm to my favorite classical radio station. So, each morning, I rise to the beautiful sounds of Bach and Mozart – music fit for a princess! If you’re longing to feel like a little princess again, remember this…take time for yourself, nurturing your mind, body, and soul. And, no matter how small the gesture or behavior, whatever you do, do it with confidence and style – the tiara is optional. I liked this blog. It was fun and something I can relate to. Good Job, you got the older generation interested. ha.